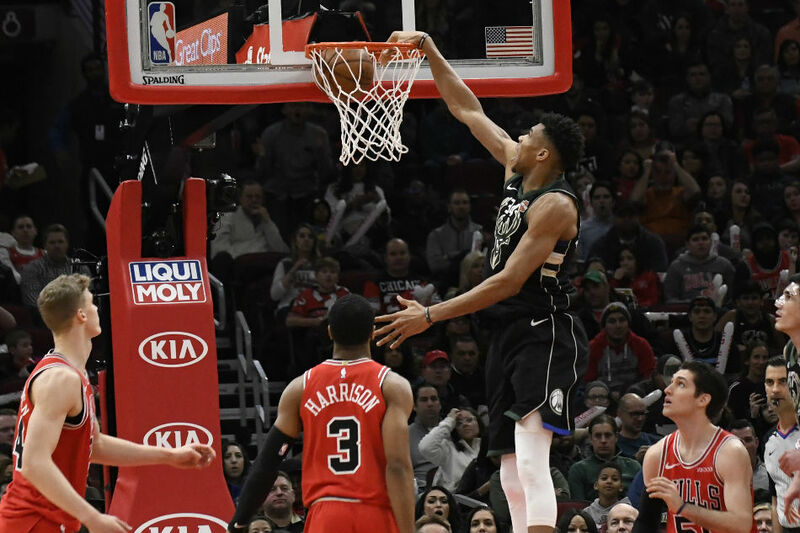 Giannis Antetokounmpo returned from a one-game rest to score a game-high 29 points Monday night, leading the Milwaukee Bucks to a 112-99 victory over the Chicago Bulls in Chicago. The win was the Bucks' third straight over the Bulls this season after Milwaukee had taken victories by 19 and three points at home in November. Antetokounmpo was a healthy scratch from Saturday's 103-83 home loss to Orlando. He returned with his fifth straight game with 29 or more points, a stretch during which he has averaged 33.6 points per game. The Bucks led by just one at halftime before using 7-0 and 8-0 scoring bursts early in the third period to go up by as much as 65-53. Milwaukee retained a 79-71 lead at period's end, then held on as Chicago closed within 100-97 on two free throws by Lauri Markkanen with 2:55 to play. Eric Bledsoe countered with a 3-pointer and added two free throws 55 seconds later to help the Bucks pull away. Bledsoe (19 points), Malcolm Brogdon (17), Khris Middleton (16) and Ersan Ilyasova (12) also scored in double figures for Milwaukee, which has won six straight on the road. The Bucks outshot the Bulls 47.5 percent to 38.5 and enjoyed a 24-16 advantage in free-throw points. Zach LaVine had a team-high 27 points for the Bulls, who lost their 11th straight at home. The scoring total was LaVine's 24th this season of 25 or more points and his fourth in a row. He had scored 28, 26 and 26 in his previous three games. Lauri Markkanen had a 20-point, 17-rebound double-double for Chicago, while Otto Porter Jr. had 18 points and Robin Lopez 17. Playing in his third game for the Bulls after being acquired from Washington, Porter hit a pair of 3-pointers and recorded 17 or more points for the third straight time. Nikola Mirotic, the Bucks' prize acquisition at the trade deadline, sat out his 10th straight game with a strained right calf. Milwaukee led for most of the first half, but could not pull away and had to settle for a 50-49 advantage at the break. LaVine led all scorers in the half with 17 points.